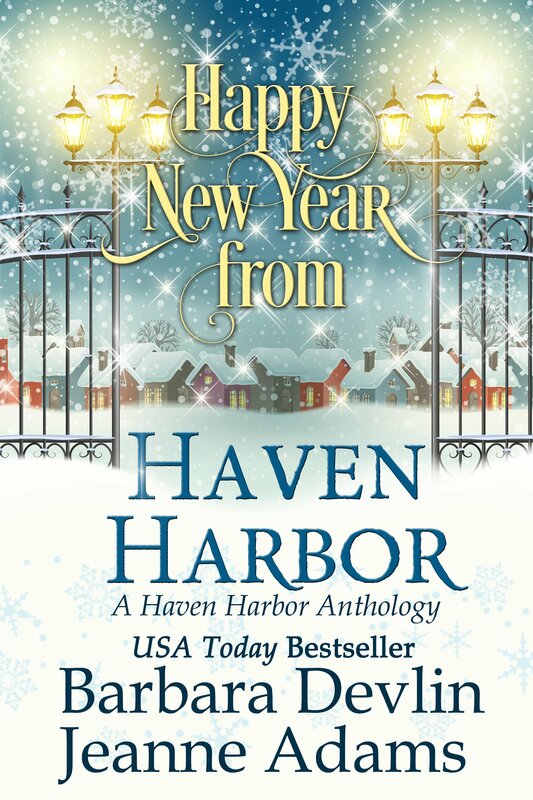 USA Today Bestselling author Barbara Devlin and award-winning author Jeanne Adams come together to bring you a very special Haven Harbor holiday collection. Hunt Parker journeys to Haven Harbor in search of the half-sister he’s never met. It’s the holidays, and Hunt just wants to know his family. The last thing he’s looking for is love. Blessed with a unique power, the gift of music that attracts women, he dodges Cupid’s arrow, because he doesn’t know what’s real and what’s magick. But Addilyn Taylor is hearing-impaired and free of his magickal influence. Can the jaded male witch find happiness with the perky baker in the midst of a record-breaking blizzard? Dr. Garnet Simpson loves the epic holiday snowstorm until an accident at the foot of her driveway sends her headlong into the gale. To Garnet’s surprise, she finds her one-time flame Guy Kalama, along with his pregnant sister and their horses in a crashed truck and trailer. As the storm worsens, Garnet shelters the duo, but Guy is Garnet’s worst nightmare. While their powerful attraction hasn’t faded, grief still haunts his life, so she’s wary where he’s concerned. Will Guy’s dark past push Garnet away forever, or will a snowy Haven Harbor New Year heal his heart? A starry-eyed girl, a cocky football jock, and peer pressure converge on one fateful night, leaving behind two broken hearts. Three years later, Russell Lee McBride returns to Haven Harbor, intent on righting the wrongs of his youth and winning pretty Cindy Parker. Can the two young sweethearts overcome the pain of the past to find true love? Big city doc Rafe Owen yearns for the simple life and a small town girl. When he accepts a temporary position at Haven Harbor Regional Medical Center, in a quirky little community known for its tongue-in-cheek embrace of witch lore, he falls for the beautiful bartender with a unique ability to guess her customers’ drink of choice…but that’s not the only power she possesses. The owner of the Old Haven Mill Tavern, Mary-George McBride, George to her friends and family, is a kind-hearted witch blessed with the claircognizance of desire. In short, she knows what people want. When she meets Rafe, the cocky Chief of ER Medicine, his naughty thoughts make it clear he wants her, but can the hot doc accept that George and the witch are one and the same? If you loved award-winning THE LION OF THE NORTH from Kathryn Le Veque’s de Wolfe Pack series, then you’ll adore the stunning Medieval pagentry, adventure, and romance in the Heirs of Titus de Wolfe collection. Lone Wolfe: Harboring a secret, the truth of his parentage, imparted by his mother on her deathbed, Titus Saint-Germain finds himself trapped between two warring factions with no escape. The Big Bad De Wolfe: The firstborn of Titus and Desiderata, Arsenius De Wolfe successfully defends the realm and is rewarded with a new title, an estate, and a highborn wife, but can he win her heart? Tall, Dark & De Wolfe: Sir Titus De Wolfe resolves to uphold the family legacy, until the incomparable warrior meets the one challenge he has never confronted–an unyielding bride. A De Wolfe never falters, even when love beckons. In the Year of Our Lord 1497, an estimated fifteen thousand rebels march from Cornwall to London to protest the King’s taxes levied to pay for the war against the Scots. Lady Senara Arscott is a Cornish-born beauty caught in the games men play. After her father and her fiancé revolt against the Crown, her family is stripped of its heritage, its fortune, its home, and its title. To reinforce His Majesty’s political connections, she is forced to wed the enemy, a man known only as De Wolfe. When untrained and poorly armed revolutionists confront the Sire’s professional soldiers at the Battle of Blackheath, one man, a fierce warrior, claims countless lives in the heat of conflict. The firstborn of Titus and Desiderata, Arsenius De Wolfe successfully defends the realm and is rewarded with a new title, an estate, and a highborn wife. In short, Arsenius wins everything Senara lost, but can he claim her heart? It is the tempestuous time of the Wars of the Roses and, as the Lancasters and the Yorks battle for the Crown, Lady Desiderata de Mandeviel is caught in the games men play in their lust for power and privilege. Contracted to wed from birth, she welcomes a union with the love of her life, the greatest lancer in England, Titus Saint-Germain. When her father delivers news of her betrothed’s untimely demise, and demands she marry another, Desi must choose between her heart’s desire and family loyalty. Will Desi trust her instincts or yield to paternal authority? Harboring a secret, the truth of his parentage, imparted by his mother on her deathbed, Titus Saint-Germain finds himself trapped between two warring factions with no escape. A loyal Yorkist, the warrior knight serves with distinction and valor, until his own men, in the heat of battle, betray him. It is a scene eerily similar to the one that claimed the life of his father, the great Titus de Wolfe, at Towton, with a singular exception. Help arrives in the form of an unlikely ally—an uncle unaware of his brother’s progeny. Will Titus resist fate and deny his destiny, or will the Lone Wolfe, at long last, journey home to the Lair?